At 51,000 square miles, Ecuador’s Galápagos Marine Reserve (GMR) is one of the world’s largest marine protected areas. Due to its isolation, over 20% of the terrestrial and marine species in the Galápagos Islands are found nowhere else on earth. Sadly, it’s also a hotbed for illegal fishing activity that threatens the archipelago’s biodiversity. WildAid estimates that at any given time, there are between 1-5 commercial vessels fishing around the GMR, with illegal take of sea cucumber, lobster, and several species of tuna, shark and billfish. Ecuadorian commercial longliners from the continent are the primary threat to the Galápagos, with crews often towing smaller boats that enter the reserve. (Costa Rican and Colombian fishermen pose a threat as well.) We also estimate that some operations are tied to organized crime: Contraband includes narcotics, shark fin and fuel, which is heavily subsidized by the Ecuadorian government and is sold at sea. Working in cooperation with the Galápagos National Park Service and partners, WildAid aims to make this reserve the best-protected marine reserve in the developing world. Recently, we partnered with colleagues at World Wildlife Fund to conduct a three-day operations and marine enforcement training with over 40 wardens from the Galápagos as well as continental protected areas such as Machalilla, Pacoche and Santa Clara. WildAid and Cotecna Certificadora Services hosted a four-day course earlier this month for officials from Agrocalidad, the Galapagos National Park, the Galapagos Government Council, and Charles Darwin Foundation. The training course focused on improving participants’ knowledge about international maritime regulations and practices related to the inspection of boats, containers, and cargo for the protection of human and environmental safety. WildAid’s continued work with the Galapagos Cargo and Quarantine Initiative, an endeavor committed to protecting the Galapagos Island’s unique biodiversity from exotic species and diseases introduced via food and product shipments from mainland Ecuador, has recently resulted in the streamlining of off-loading procedures at cargo dock facilities on two of the islands as well as a national regulation that requires Galapagos cargo ship owners to renew and classify their ships according to international standards within a one-year timeframe. 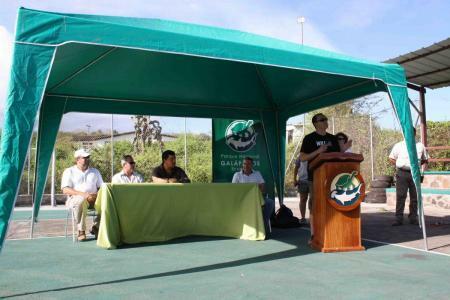 WildAid recently partnered with World Wildlife Fund and Conservation International to conduct a five day workshop aimed at improving the control and effectiveness of the Galapagos National Park Service (GNPS). The workshop was administered by Harkcon, a leader in organizational and workforce management, and included special guests such as Coco Islands National Park Wardens, the Costa Rica Coast Guard, and Ecuador Undersecretary of Fisheries Officials. Early every morning, the cold water lapping up on the beach here is stained red with blood as surly, determined men in ragged T-shirts drag hundreds of shark carcasses off wooden skiffs and onto the white sand. Using eight-inch boning knives with quick precision, they dismember the once-mighty predators, cutting off heads, carving up big slabs of meat, slashing off the tails. Most important, they cut off the fins - dorsal and pectorals - a "set" that can fetch $100 or more. In Ecuador, celebrities don't come more celebrated than Alex Aguinaga, the country's most widely recognized soccer star and one of its most respected citizens. So Ecuadorians took notice last October when Aguinaga—along with the coach and four other top players of the country's World Cup-bound national team—launched a petition drive aimed at pressing the government to curb the wholesale killing of sharks. Recently, two isolated incidents occurred on the island of Baltra, Galapagos Islands that warrant dissemination to the international community and must be addressed by the President of Ecuador. On March 14th, the Ecuadorian Navy arrested two Park Wardens in Baltra who were investigating a denouncement made by PetroEcuador. A single hulled tanker was illegally transferring and selling diesel fuel to a foreign yacht in a highly sensitive area. WildAid was one of only five winning applicants, out of 311 total, to win the UNDP Equator Prize for our work with the Women’s Association Pescado Azul, in the island of Isabela, Galápagos. Pescado Azul provides jobs for unemployed women and sustainable economic alternatives for fishermen. Traditionally, the fishermen have relied on declining coastal sea cucumber, lobster, and shark populations for their livelihood. The association provides an alternative by creating a market for yellowfin tuna, a migratory species, which is processed, smoked and sold to tourists.